Giovanni Battista Brasacchio first appears in the Painesville, Ohio, area in May, 1919. In America, Giovanni Battista Brasacchio was known as John Brasacchio. Giovanni Battista Brasacchio was born on December 13, 1878, at San Pietro in Guarano, Italy. He married Francesca DeBiase in 1900 at Italy. Giovanni died on June 3, 1967, at Lake County Memorial Hospital, Painesville, Lake County, Ohio, at age 88. His body was interred at St. Mary Cemetery at Painesville Township, Lake County, Ohio. Giovanni Battista Brasacchio, age 26, immigrated to the United States on June 11, 1905, travelling to Braddock, Pennsylvania. Mr. Brasacchio retired from the Diamond Alkali Company in 1950. At the time of death, Giovanni resided at 561 Storrs Street, Painesville, Lake County, Ohio. 1. Pasqualina Brasacchio was born on October 9, 1902, at Lapprano, Italy. She married Joseph Dolce, son of Francesco Dolce and Francesca Geraci, about 1921. Pasqualina died on February 3, 1989, at LakeEast Hospital, Painesville, Lake County, Ohio, at age 86. Her body was interred at Riverside Cemetery at Painesville, Lake County, Ohio. 2. Eugenio Brasacchio was born about 1904, at Lapprano, Italy. He probably died before 1910. 3. Rose M. Brasacchio was born on April 16, 1909, at Ohio. She married Walter Randa on April 26, 1930. Rose died on July 6, 1997, at age 88. Her body was interred at Riverside Cemetery at Painesville, Lake County, Ohio. 4. Irene M. Brasacchio was born on October 5, 1910, at Ashtabula, Ashtabula County, Ohio. She married Eino J. Wainio. Irene died on May 15, 2005, at Altercare of Mentor, Concord Township, Lake County, Ohio, at age 94. Her body was interred at Riverside Cemetery at Painesville, Lake County, Ohio. 5. Dorothy Brasacchio was born on March 14, 1912, at Ashtabula, Ashtabula County, Ohio. She married John Edward Raudasaw. Dorothy died on June 23, 2007, at St. Joseph’s Care Center, Louisville, Stark County, Ohio, at age 95. Her body was interred at Riverside Cemetery at Painesville, Lake County, Ohio. 6. Anthony M. Brasacchio was born on September 7, 1913, at Ashtabula, Ashtabula County, Ohio. He married Ruth Cook. Anthony died on September 7, 2005, at Homestead II Nursing Home, Painesville, Lake County, Ohio, at age 92. His body was interred at Riverside Cemetery at Painesville, Lake County, Ohio. 7. 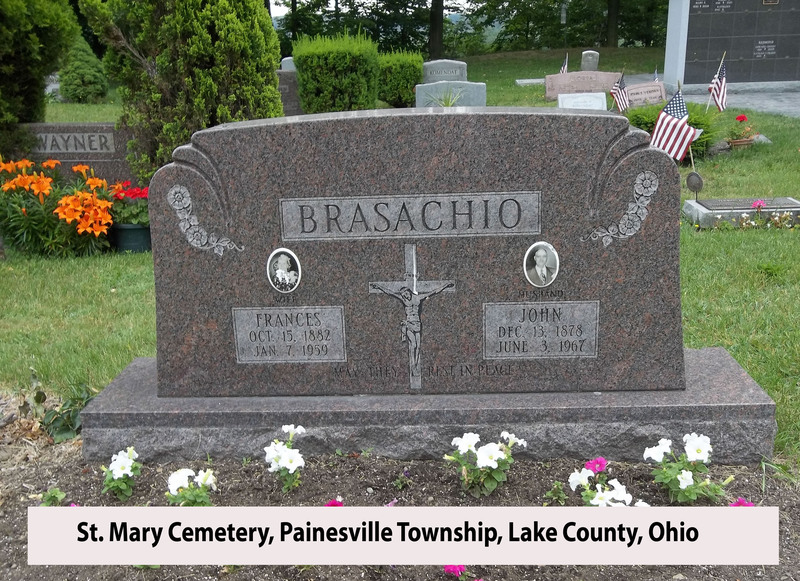 John P. Brasacchio was born on May 17, 1915, at Ashtabula, Ashtabula County, Ohio. John died on April 15, 1934, at Good Samaritan Hospital, Zanesville, Muskingum County, Ohio, at age 18, of a concussion of the brain after being struck by an automobile C.C.C. Camp #579, New Lexington, Perry County, Ohio, on April 15, 1934. His body was interred at St. Mary Cemetery at Painesville Township, Lake County, Ohio. 8. Helen H. Brasacchio was born in 1916, at Ohio. She married Raymond Randa. Helen died in 1961. Her body was interred at Riverside Cemetery at Painesville, Lake County, Ohio. 9. Marie Brasacchio was born on April 3, 1918, at Ashtabula, Ashtabula County, Ohio. Marie died on July 5, 1922, at Storrs Street, Painesville, Lake County, Ohio, at age 4. She was fatally burned when her clothes caught fire. Her body was interred at St. Mary Cemetery at Painesville Township, Lake County, Ohio. 10. Louise Brasacchio was born in 1920, at Ohio. Louise died in 1926. Her body was interred at St. Mary Cemetery at Painesville Township, Lake County, Ohio. 11. Virginia Brasacchio was born on May 9, 1921, at Painesville, Lake County, Ohio. She first married Frederick L. Doyle. After Mr. Doyle passed away, she married second, John C. Bonelli, son of Gaspare Bonelli and Frances M. Tabone, on May 7, 1955 at St. Mary Catholic Church, Painesville, Lake County, Ohio.